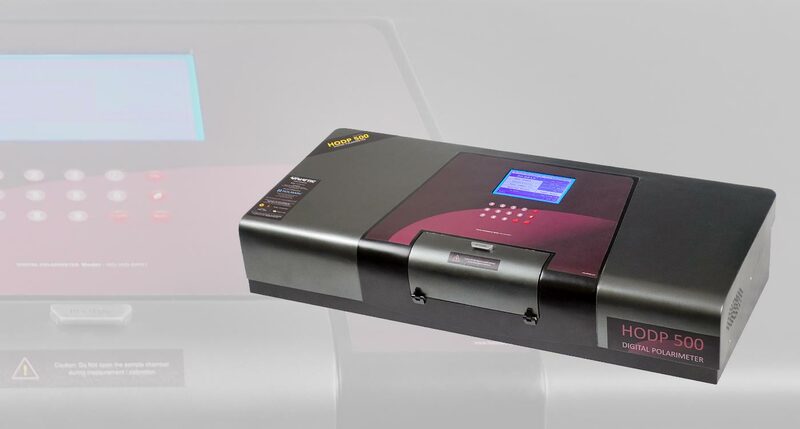 Holmarc manufactures automatic digital polarimeters for industry and research with robust performance and efficiency. Symmetric angular oscillation optical null technique by Faraday Modulation is implemented in our polarimeters to achieve high resolution and repeatability. Operation is simple: place the sample filled tube in the automatic Polarimeter and press READ button. Measurement is displayed on the soft colour LCD display of the instrument. The Polarimeter is used for determining the optical rotation of substances. By measuring optical rotation, the concentration, content, purity etc of the sample solution can be found out. Polarimeter has become one of the most useful instruments in research laboratories of sugar industry, pharmaceutical industry, oil refining, food industry, chemical industry as well as basic research in universities and R&D organizations. Major modules in our Polarimeter include light source, Interference filter, polarizer, faraday modulator, sample chamber, analyzer and Detector. Unpolarized light from light source (LED) passes through an interference filter and polarizer so that a fixed wavelength polarized light comes out. This polarized light enters the Faraday Modulator and then passes through the sample cell. The modulated light which passed through the sample cell enters a second polarizer, known as the “Analyzer,” which detects the angle of rotation. Finally, the light falls on a Silicon photo diode which converts the light intensity to an electric signal. Accuracy : ± 0.03 Deg. Measuring modes : Optical Rotation, Specific rotation, Concentration, Optical Purity & Sugar Scale. Optical rotation is directly proportional to path length; the longer the tube, the greater the overall accuracy. Holmarc’s Polarimeter accepts tubes up to 200mm long. A 200mm sample tube offers twice the sensitivity compared to measuring the same solution in a 100mm sample tube. Different types of sample tubes are available up to 200mm length.